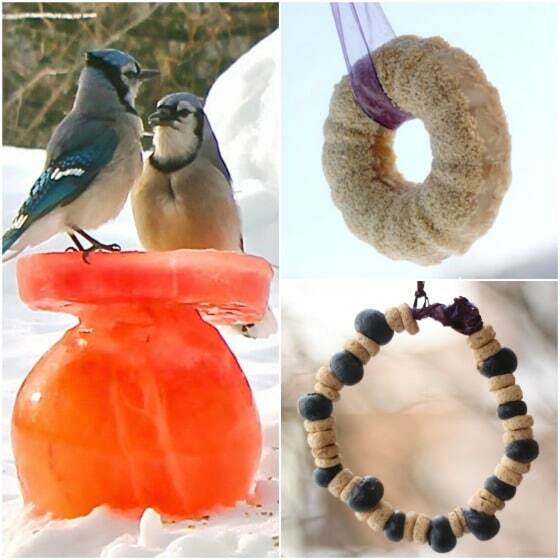 Making homemade bird feeders for your backyard is a fun way for you and your kids to get to know which birds are native to your area, and a great way to help out your feathered friends when their food sources are scarce in winter-time. Every winter, here in my daycare, we make homemade bird feeders to scatter among our trees and gardens. 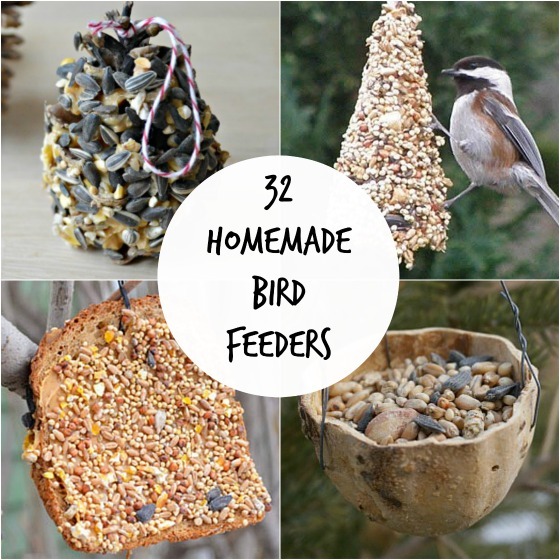 We like to keep things on the simple side here, so we always use common household materials to make our feeders. The hooligans always love the process, and they get so excited when they discover birds and squirrels nibbling away at the feeders they made with their very own hands. 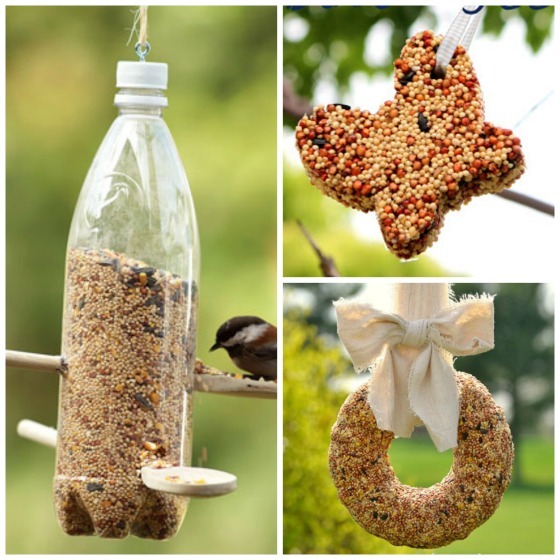 Here are 32 easy and beautiful bird feeder crafts to inspire you and your kids. 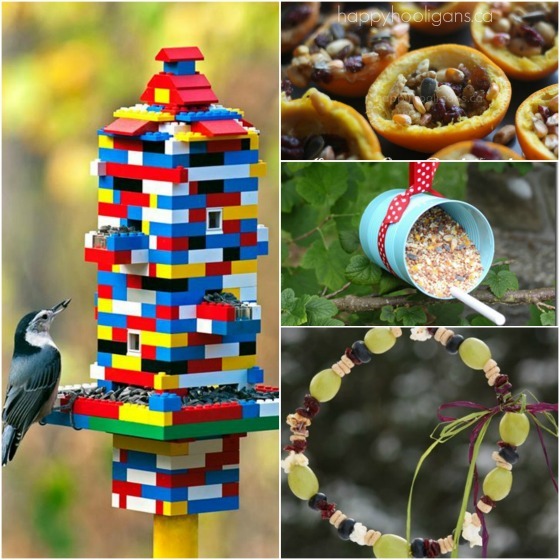 Some of these bird feeders are our own, and others, I’ve gathered from around the internet. 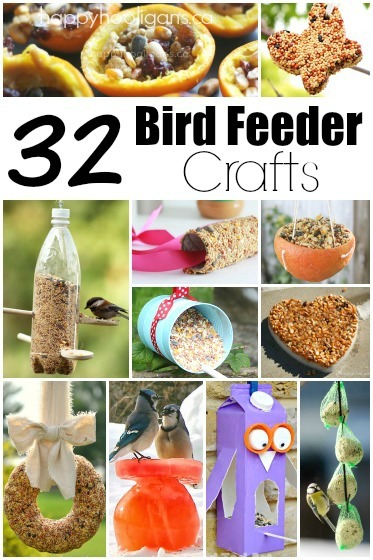 If you’re looking to make a bird feeder for your backyard, I hope you’ll find an idea or two that you like here! I love the natural look of these hanging gourd feeders by Kitchen Counter Chronicles. 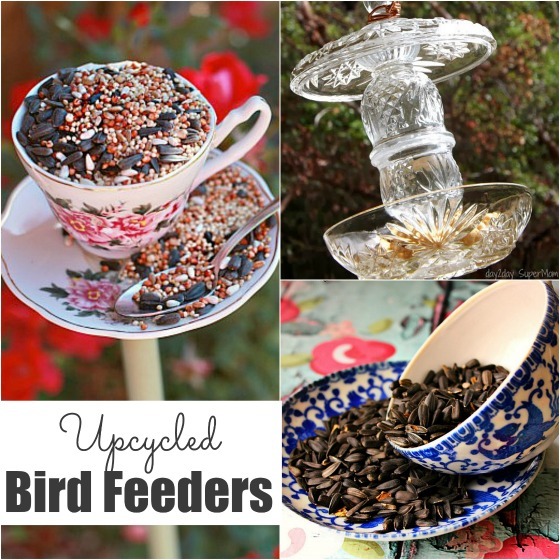 You can turn a paper plate into a bird feeder in a jiffy! 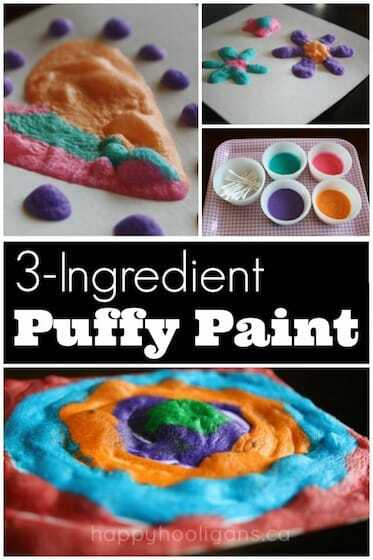 This one is great for fine motor skills, and doesn’t require any special tools to make it! Lego-maniacs and bird-lovers unite! Check out this amazing Lego feeder over at Fun Crafts Kids. When we make fresh-squeezed juice, we use our leftovers to make orange cup bird feeders to stake in the garden. 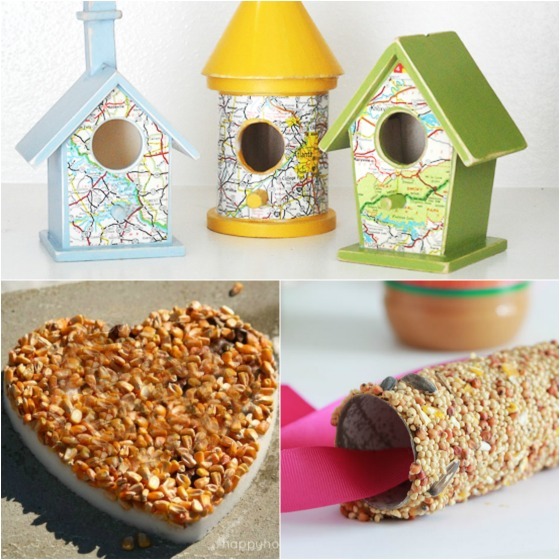 These easy rainbow ice bird feeders are stunning! 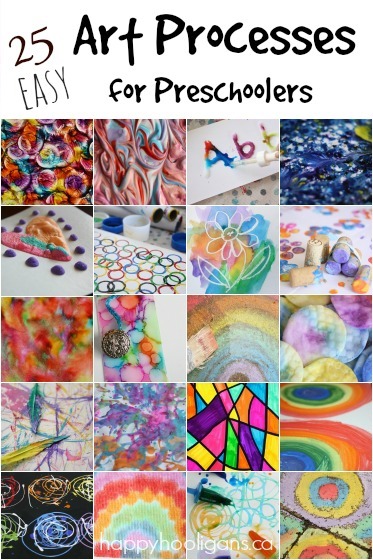 Check out all the colours that Twig and Toadstool made! 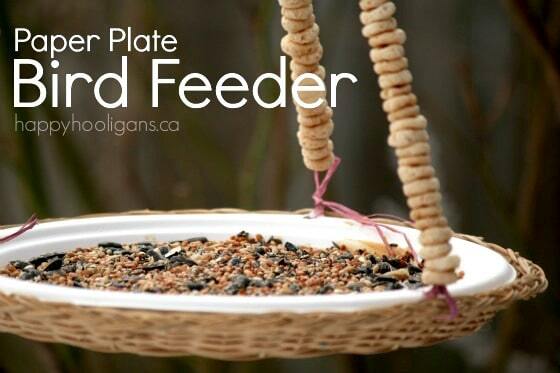 The hooligans loved threading these simple cheerio and blueberry feeders! This simple plastic jug bird feeder kept our birds and squirrels happy all through the winter last year. We used snow as a base for our corn kernel and chestnut feeder. The blue jays and squirrels LOVED it! “Messy Fingers Science” says it took less than two minutes for the cardinals to find her spoons and soda bottle bird feeder! I’m in love with this bundt pan bird seed wreath by Infarrantly Creative. The rustic bow is rustic and classy at the same time. 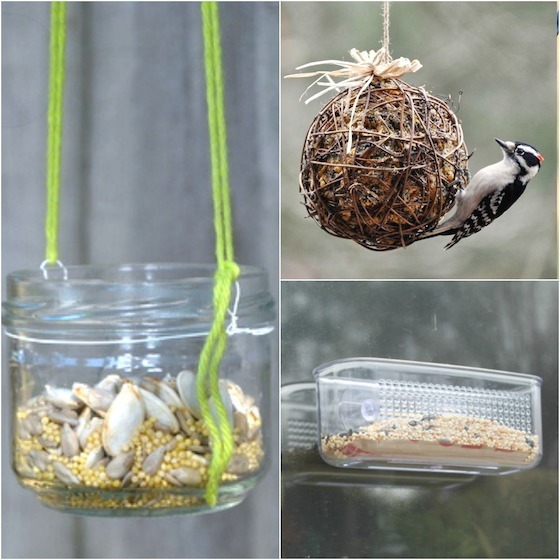 And last but definitely not least: Get a close-up view of your neighbourhood birds with a simple and inexpensive suction cup bird feeder! Happy building and happy birding! 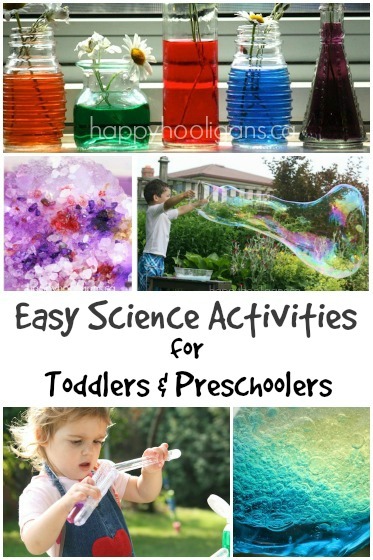 40 hands-on, learning activities for kids ages 3-8. 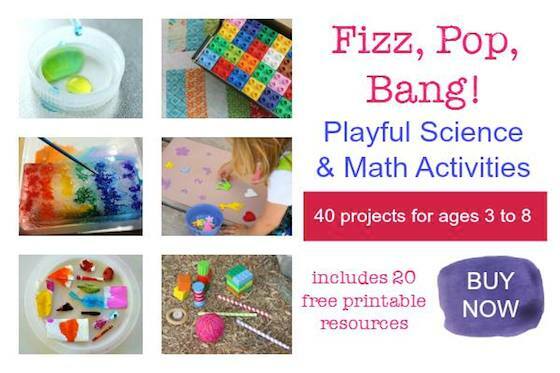 Recipes, experiments, art projects, printables and play ideas with links to 80 activities not featured in the book. All for $9.99. Bread – any kind – is a big no no for all birds. Hi Angela, I felt I should respond as I’m not sure your comment is entirely correct. I’m not sure what your background is – if you’re a biologist or an ornithologist, but if you are, please correct me if I’m wrong. I’ve always understood that bread, in moderation, is fine for birds. Birds cannot however, exist solely on bread, as it doesn’t offer enough nutritional value. A little here and there shouldn’t be a problem, which would be the case if you were to make the bread feeder that you see in the post. Before responding, I did a little googling. Here are three links that I found, but again, please correct me and provide sources if you have information that conflicts with these articles. Thank you so much. I agree… no bread, and absolutely no white bread, or moldy bread products. Using them WILL kill birds. Another no-no is dried rice. It will expand in the birds stomach, and cause death. Do not use SALTED peanut butter. Birds (with the exception of sea birds) cannot excrete salt from their bodies, and may eventually die of dehydration. Rice expanding and killing birds is an Urban Legend/Myth. Google is your friend. I’m not sure, Amy, but if you click on the link you’re referring to, you’ll be taken to that blog post, Amy, and from there, you could ask that blogger. I haven’t made the cookie cutter ones myself, although they look awesome! These all look fantastic. My grandparents and parents used to be bird watchers, and passed it along to me. 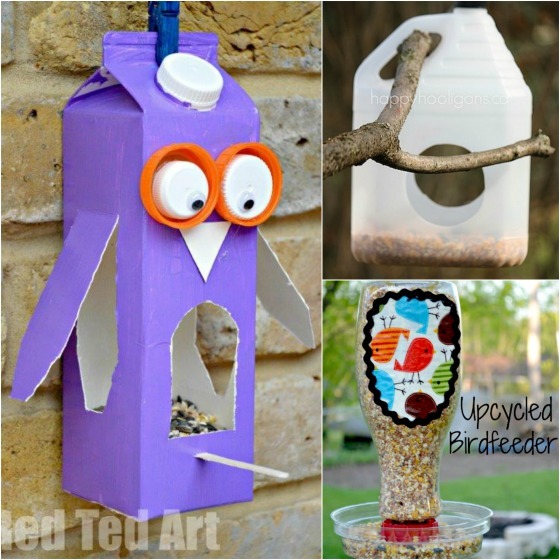 I think I will be making the painted can feeders with my two small children soon! 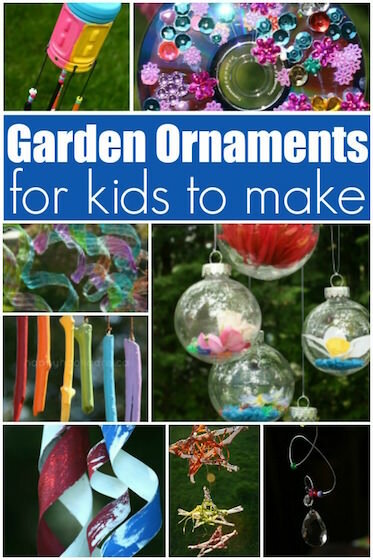 It’s too cold to play outside right now, and I can hang these from the trees and the kids and I can watch the birds eat from the living room windows:) Thanks for all of the great ideas! 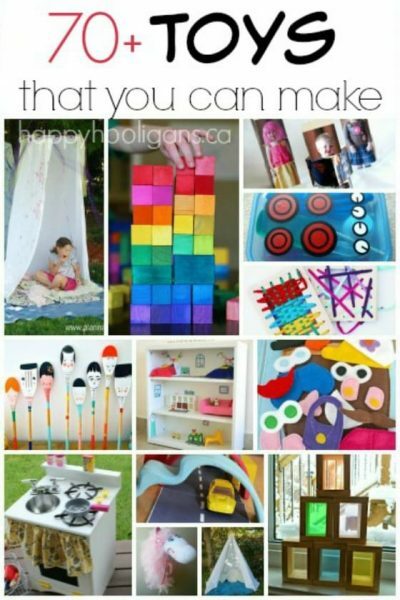 Awesome ideas and crafts for parents and kids to do together. Our local lake has swansand the information blurb about them states that their main diet consists of bread, along with vegetation etc from the lake. So I am sure that other birds will welcome bread as part of their balanced diet. We have Hovis seedy bread here in England,that is wholemeal with seven or more seeds added to the dough. Not only is it yummy the birds love it too. I have thought about doing several of the bird feeders using peanut buter but it disappears too fast at my house for any bird to get any. I was ready to try this one as it sounded good for drainage to avoid moldy seed but then it struck me that the birds might also be getting nylon caught in their beaks. I am passsing these on to the activities person at my Mom’s nursing home. Many are simple and can be done by those even with arthritic hands. I never knew that birdwatching with my curious children would be so much fun. Now my grandchildren enjoy the birds too! 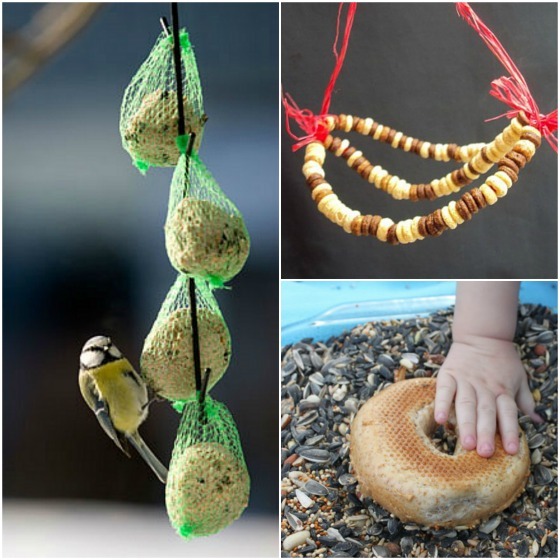 The mesh bags (those little green net bags) should not be used for feeding birds and should be removed from suet food balls if they are bought with these on. Birds can become entangled in them. Please never use ordinary peanut butter, the salt content is too high for birds. There is a salt free peanut butter for birds called Flutter Butter. Thanks for the tip, Sue! 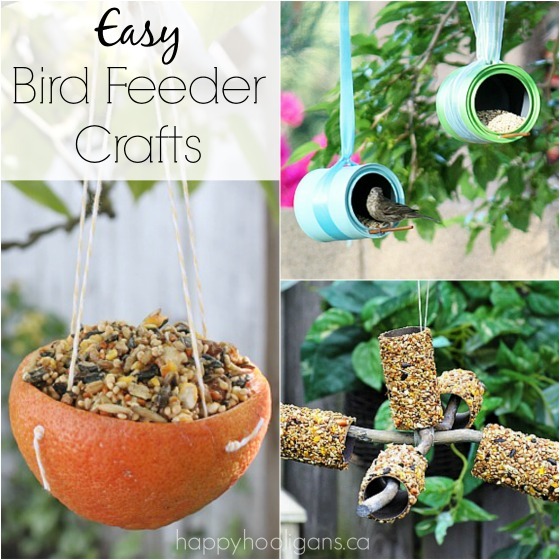 Love these feeders… must try a few. However, why in the world would you call your daycare kids Hooligans? hooliganism − unruly, destructive, aggressive and bullying behaviour. My son absolutely loves birds so I have been looking for decorative bird feeders for sale that would fit with our backyard decor. He also loves Legos so I know that he would love to build his own for the birds! I will have to keep an eye out for some of the materials to build these. Thank you for sharing them and giving me some awesome ideas! My daughter and I look through this list and she is now BEGGING me to do most of them. Very neat ideas and thank you for the list. Looks like my weekends in spring are now spoken for! That’s GREAT to hear, Jim! Have fun with them! your blog doing a great job for all of us “hooligans”! Try feeding your robins, bluebirds, Brown Thrashers and pretty much all other bird feeder birds, this recipe….. in a mixer – 4 cups cracked sunflower seed, 4 cups yellow corn meal, 1/2 of a 40 oz peanut butter jar or 20 oz. (heated in the microwave makes it easy to pour), heat vegetable shortening and pour in enough to make either one big ball or about 12 baseball size balls to feed bluebirds as well as almost all other birds. Even a couple of robins eat multiple times a day. Because of the peanut butter and vegetable shortening, the ball is somewhat waterproof and lasts about a week. No waste! You might start out by crumbling a little bit and leave the ball. Once they get used to it, they gobble it up. I feed the ball year round. American robins, Bluebirds, catbirds, thrashers, Eastern Towhee’s, yellow-bellied sapsucker, mocking birds, rose-breasted grossbeaks, cardinals, blue jays, titmice, chickadees, downy woodpeckers, red-bellied woodpeckers, mourning doves are just some of the many different birds that eat the bird ball on a regular basis. Wow! Thanks for all the info, Richard!